Great Ranches of Today’s Wild West features inspiring landscapes and the Western way of life. The ranchers, cowboys, wranglers, horse trainers and their families who fill these pages all share the dream of the West: a combination of freedom, independence, hard work, and love of the land. 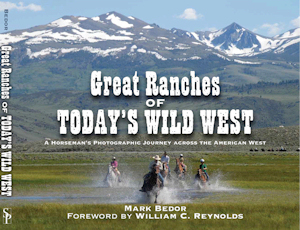 In this beautiful new coffee table book, veteran writer, photographer and horseman, Mark Bedor, explores the ranches of the modern Wild West. From the deserts of Arizona to the slopes of Colorado, to the vast ranges of Wyoming and the Canadian Rockies in British Columbia, it’s time to saddle up! More than 200 photographs, 167 large 10 ¼” x 12 ¼” pages, this book features the surroundings, features, people and history of each ranch. Reading this book is almost as good as being there in person! Only $29.95 plus shipping and sales tax for California residents, order your copy today.